Visiting Runaway Bay, Jamaica? Experience These Top 5 Activities! Runaway Bay was originally discovered by Christopher Columbus in 1494 and named Runaway Bay, due to its history of runaway slaves hiding in the Green Grotto Caves from their masters. However, today it is most well known as a popular tourist area with beautiful white sandy beaches, turquoise water, and many very unique and stunning natural attractions, such as the Green Grotto Caves, and Dunn’s River Falls. Read on to learn about our Top 5 Activities in Runaway Bay, Jamaica. The Green Grotto Caves (formerly known as Runaway Bay Caves) are one of Jamaica’s most famous natural attractions, which have been visited by tourists since the 18th Century. Green Grotto Caves are conveniently situated between the resort towns of Ocho Rios and Montego Bay, and feature 64 acres of beautiful Jamaican land. The Green Grotto Caves main feature is the large limestone cave, which has numerous rock formations, its stalagmites and stalactites, and overhead ceiling pockets. In addition, there is an underground tunnel that links the caves to the beach in Runaway Bay. The caves have a rich history, which began with the Taino Indians who used the caves for shelter; as well as a hiding place for runaway slaves to hide from their masters, Jamaican rum during WWII by the Jamaican Government, etc. To learn more about the Green Grotto Caves, visit the Green Grotto Caves website. Cardiff Hall Beach is a secluded sandy white beach located on the Northern coast of Jamaica near Franklyn D. Resort, and within walking distance to the town of Runaway Bay and near other great resorts, such as Hedonism III and Jewel Runaway Bay Beach and Golf Course. Cardiff Hall Beach is also near many beautiful natural attractions, such as Dunn’s River Falls, the Enchanted Gardens, and Coyaba River Garden and Museum. In addition, you can try local Jamaican cuisine at some of the local restaurants, such as Jamaican-style breakfast, lunch or dinner at The Little Pub. 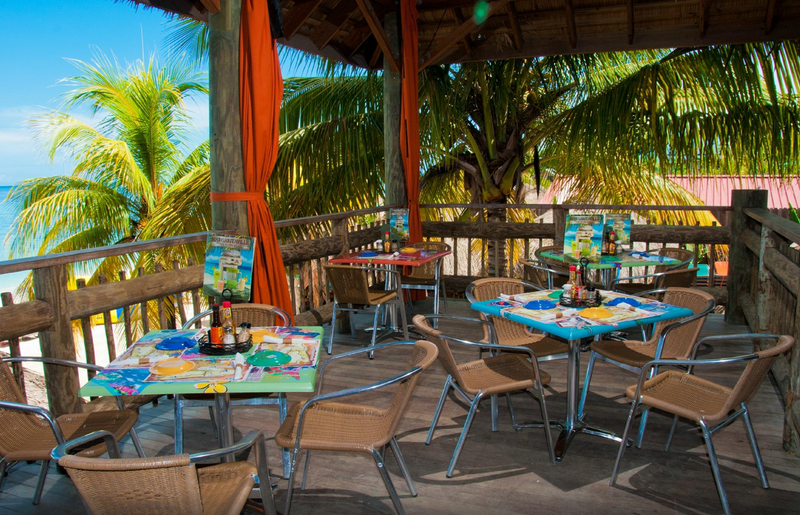 If you are looking to eat closer to the ocean you can grab breakfast, lunch or dinner at the Almond Tree Restaurant. Alternatively, if you are looking for Jamaican jerked chicken Ocho Rios Jerk Centre is highly recommended. 3. Puerto Seco Beach Park. In addition, beach chairs and umbrellas are available for rent for $5 if all of the space is taken under the beach huts. As well as private cabanas for $150, which come with a 6-pack of beer, fruit plate, juice and water, and private butler. There is a restaurant on site that serves up burgers, fish, and bar food and a Walkerswood jerk pit grills up chicken and pork. 4. Dolphin Cover Puerto Seco. Dolphin Cove Puerto Seco opened up to visitors at Puerto Seco Beach Park in March 2019. So far it features four bottle nosed dolphins, which visitors can swim with. To learn more about Dolphin Cove Puerto Seco visit the Dolphin Cove Puerto Seco website. 5. H’Evans Scent Zip Lines. H’Evans Scent zip lines is located in St. Ann’s Bay in the lush hills of St. Ann Jamaica. H’Evans Scent was founded by Derrick Lee in 2003 and was the first adventure park in Jamaica to feature zip lines and a giant 50-foot swing, which today also includes other great outdoor activities, such as a paintball course. H’Evans Scent includes 4 zip lines, one of them being the longest in Jamaica at 1,200 feet long. Besides being the first adventure park in Jamaica to feature a giant swing and zip lines, H’Evans Scent was also the first to introduce paintball to the island in 2008, which has quickly become Jamaica’s fastest growing sport. Check out the H’Evans Scent website to learn more about their latest tour packages. To book affordable private transportation to any of these tour locations in Runaway Bay, email us at travelaroundja@gmail.com or call 1-876-287-2180. If you are looking for a more relaxed, low key eco-adventure tour, make sure you check out our following list of some of our favorite Jamaica stress buster tours, where you will not only feel more in tune with nature, but you will also get to experience some of the most incredibly beautiful! hidden natural gems in the land of wood and water. Blue Hole Secret Falls in Ocho Rios is unique for many reasons. Firstly it is enjoyed by locals and tourists alike, which is very rare. Secondly, because it is a hidden 20’ waterfall waiting to be discovered in the rain forest of Ocho Rios. At the Blue Hole you can jump, swim, or dive into the refreshing turquoise pools below or go tubing down the White River. In addition, afterwards shopping in Ocho Rios can be easily be arranged. For more info, visit our Blue Hole Secret Falls Tour page. Black River is the capital of the Parish of St. Elizabeth on Jamaica’s South Coast and is located approximately 2 hours by car from Montego Bay. 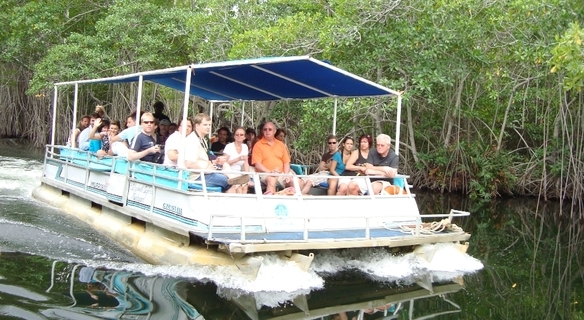 The Black River and Pelican Bar Tour is a great off-the-beaten path tour for people looking to discover the hidden natural wonders of Jamaica, such as the Black River, which is Jamaica’s largest navigable river and includes the largest wetland area, i.e. the Black River lower morass, which is full of exotic species, such as the Alligator. Floyd’s Pelican Bar is located on a shoal 3/4 miles off of Parottee Bay. At Floyd’s Pelican Bar you can enjoy a seafood lunch, Red Stripe beer or another Jamaican beverage of your choice; as well as go scuba diving and carve your name in the bar. For more info visit our Black River Safari and Pelican Bar Tour page. What could be more relaxing than floating down the stunning! Martha Brae River with your partner or family by your side? The tour starts at the Rafter’s Village, which consists of over 5 acres of manicured lawn with picnic areas, souvenir shops, a swimming pool, a service bar and restrooms. The Martha Brae River Rafting Tour is a three mile, hour long ride along the Martha Brae River on a 30 foot bamboo raft, which is guided by one of 80 professionally trained and experienced raft captains. The river rafting tour ends at Martha’s Rest where there are more gift shops, a bar, restrooms, and a lounge area. You can also swim in the river during the tour, so make sure you bring your bathing suit if you want to swim! 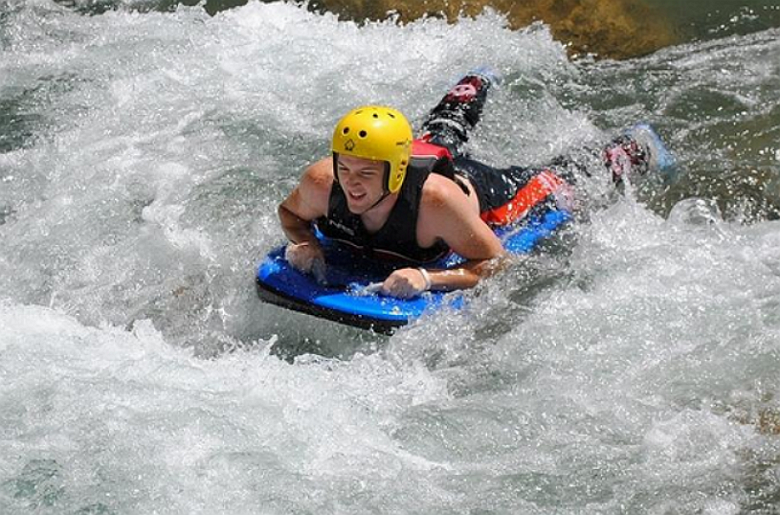 For more info visit our Martha Brae River Rafting Tour page. During our Luminous Lagoon Night Tour you will get a once in a lifetime chance to take a guided boat tour into the luminous lagoon at night and swim in the glistening warm luminescent water where you’ll get to see you and your friends and families’ shadows, as well as fish, while having photos taken. For more info, visit our Luminous Lagoon Night Tour page. On our Falmouth Safari Village Tour you will get the opportunity of a lifetime to take a walk on the wild side! 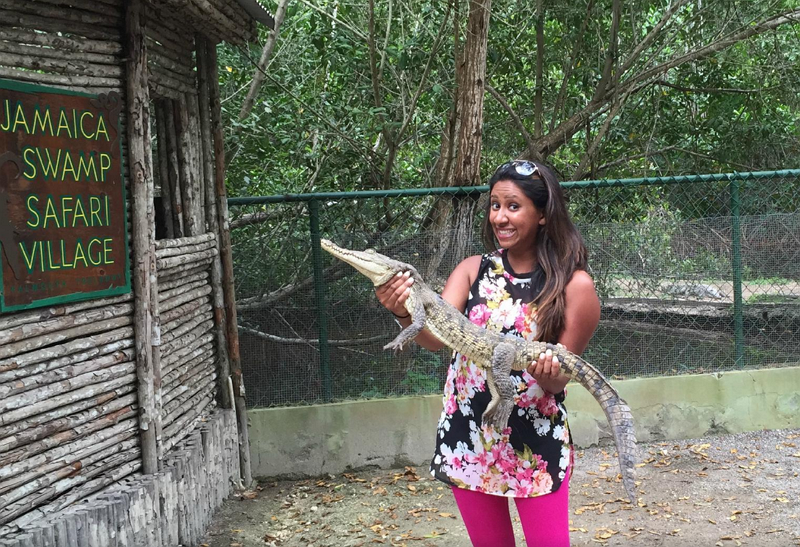 and meet up close and personal some of the most incredible rare exotic animal specials, such as an 18-foot Anaconda named “Shakira”, rare crocodiles, as well as tour Jamaica’s largest walk-through aviary, which has a large variety of exotic birds. Visit our Falmouth Safari Village Tour page to learn more about this incredible Jamaican Safari Tour! If you are looking for a more laid back Jamaican waterfall tour than Dunn’s River Falls, Mayfield Falls is the perfect! place for you with its largest waterfall being just 3 feet deep and generally calm river currents. Enjoy everything from the rain forest to the countryside in this popular Jamaican eco-adventure tour. Mayfield Falls is composed of 2 waterfalls and 21 pools of clear, clean swimming water that will be pointed out to you by your expert tour guide along the way. Along the Mayfield River there are 52 different fern species, and other native Jamaican flowers, plants, and wildlife, such as birds and butterflies. At the end of the hike, you’ll reach the beautiful falls where you can swim and enjoy the water with your friends and family. There is also a great! café on site where you can enjoy local cuisine. To learn more or book this tour, please email us at info@travelaroundjamaica.com or call us at 1-876-276-2180. Travel Around Jamaica Tours is dedicated to providing fun and affordable Jamaica adventure and sightseeing tours to all tourist destinations in Jamaica, including popular tourist destinations, such as Ocho Rios, Montego Bay, Negril, and Falmouth. We guarantee 1st class, round-trip private Montego Bay airport transfers to all hotels and resorts in Jamaica, starting at $54! To learn more, visit www.travelaroundjamaica.com. Although Falmouth, Jamaica has a great variety of shops and restaurants near the Falmouth cruise ship terminal that you can visit while docked at port for the day; if you’re looking for something a little more adventurous, check out our list of top 5 Falmouth Jamaica cruise excursions. Travel Around Jamaica Tour’s River Tubing and Beach Tour from Falmouth, Jamaica, includes tubing on the incredibly beautiful Rio Bueno River, lunch at an authentic Jamaican Jerk spot in Runaway Bay and more! Our Negril Private Highlights Day Tour from Falmouth is perfect for small or large groups, and can be customized to fit your specific travel tour preferences. Some of the highlights of this tour, include: stops at the 200 year-old cast iron Tryall Water Wheel; an old military barracks, Margaritaville Negril, and the world famous Rick’s Café in Negril. On our Falmouth Safari Village Tour you will get the opportunity of a lifetime to take a walk on the wild side and meet up close and personal some of the most incredible and rare exotic animal species, such as an 18-foot Anaconda named “Shakira”, rare crocodiles, as well as tour Jamaica’s largest walk-through aviary, which has a large variety of exotic birds. Visit our Falmouth Safari Village Tour page to learn more about this incredible Jamaican Safari Tour! 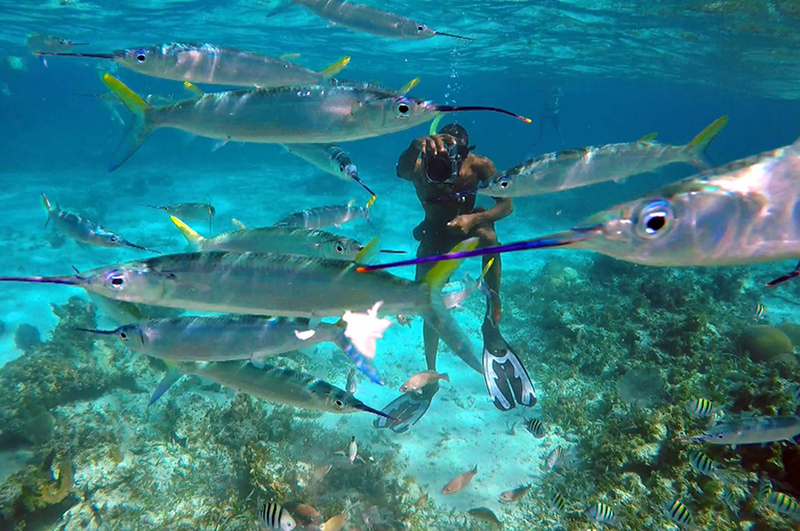 On our Private Doctor’s Cave Beach and Snorkeling Tour you can enjoy snorkeling, relaxing on the beach, swimming, and a delicious lunch of authentic Jamaican jerk burgers or other local Jamaican staples if you are vegetarian or prefer something else. If time permits, you can also go shopping at nearby shops for souvenirs. During our Private Zipline Adventure Tour you will be taken to Hevans Scent Ziplines to experience some of the best ziplines in Jamaica, located in Priory about 2000 ft up with a view across the green fields of St. Ann, the garden parish. At Hevan’s Scent Ziplines in Ocho Rios there are 5 ziplines (including the longest in Jamaica! 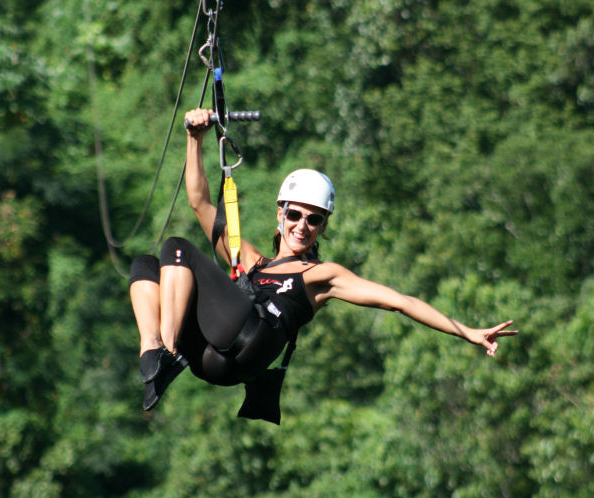 ), as well as 5 rides to choose from, providing everyone among your friends or family with something to do, regardless of their ziplining experience or age. Your driver will then take you to Scotchies or another popular jerk stop where you can have lunch and relax with a cold Red Stripe beer or alternative beverage, before heading back to the pier. When many people think about a dream vacation in the Caribbean, they’re thinking of Jamaica. Hot sunny weather, beautiful blue beaches, luxurious resorts, and fun and drinks abound. A cruise to this wonderful summer paradise is just what many of us want for our next vacation. One of the most famous and exciting attractions on the island is Seven Mile Beach in Negril, Jamaica. This small town is a beach resort with a population of only about 3,000 people which thrives on tourism drawn by its beautiful beaches. American hippies discovered this perfect haven about 30 years ago and have been making an attraction out of it ever since. There are plenty of hotels in Negril, Jamaica, on 7 Mile Beach as well as restaurants, relaxation spots, and care-free beach atmospheres. Seven Mile Beach in Negril, Jamaica, is the perfect destination for anyone who just wants to relax without a worry in the world for a week. If you’re looking for things to do in Negril Jamaica, you’ve come to the right place. Travel Around Jamaica Tours has provided a short list of 5 attractions that you won’t want to miss if you visit 7 Mile Beach in Negril, Jamaica. 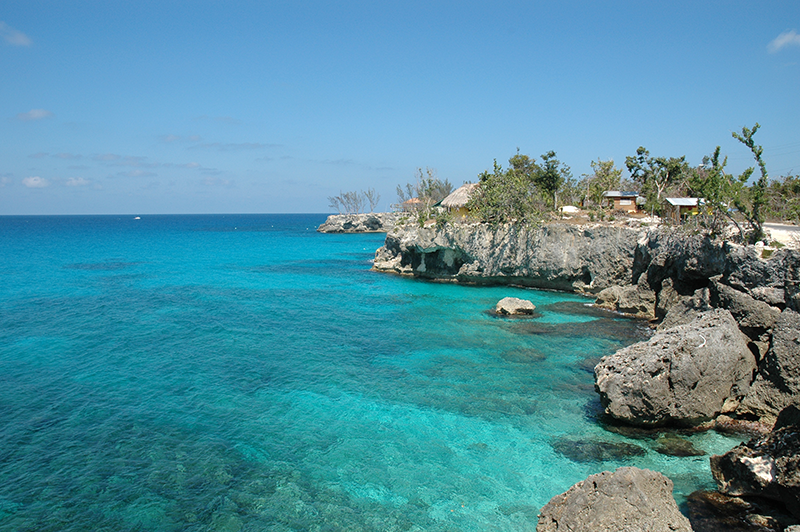 Negril Cliffs is a great attraction where you can get out and swim around the gorgeous cliffs that were featured in the James Bond movie “Thunderball”. You can swim in the caves or travel the premise in a boat. One of the greatest things about this spot is that it’s a perfect opportunity to get away from the crowds at Seven Mile Beach. Be sure and set aside a day to enjoy the historical sightseeing tour that ends with a sunset, dinner, and cocktails at the famous Rick’s Cafe. You’ll have the opportunity to tour the local shops, enjoy all seven miles of the white sandy beaches of Negril, and hear all about the town’s heritage and history with a knowledgeable tour guide who joins you along the ride. 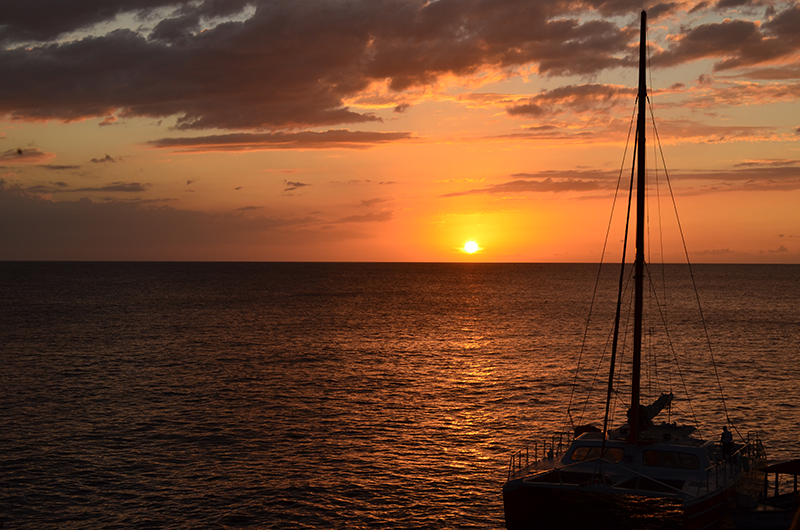 For more info on our Sunset Day Tour at Rick’s Cafe, check out our Negril Sunset Day Tour page. For a taste of nature and the world under the sea, rent out some snorkeling or scuba diving equipment and dive right in. The waters of Negril are clear blue and waiting for explorers. Enjoy the wildlife and the vibrant ocean floors of Seven Mile Beach for an experience like no other. Enjoy everything from the rainforest to the countryside in this popular nature tour. Mayfield River is complete with pools of clear, clean swimming water that will be pointed out to you by your expert tour guide along the way. At the end of the hike, you’ll reach the beautiful falls where you can swim and enjoy the water with your friends and family. Cruise by the shore and enjoy the breathtaking sunset of Negril with this excellent boat tour. 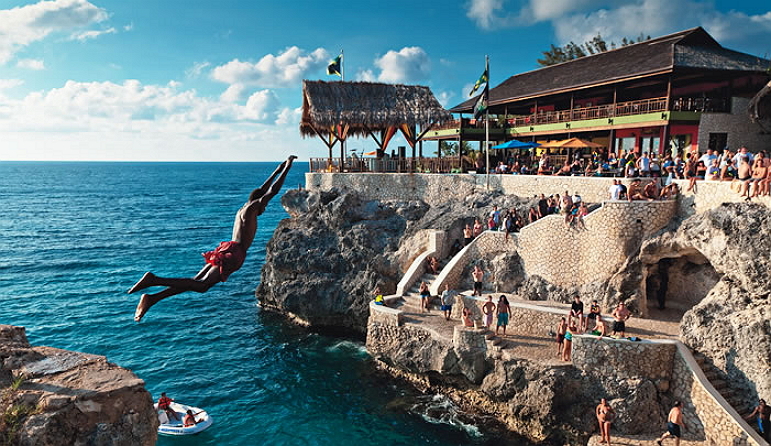 You’ll pass the Negril Cliffs to watch the brave divers, cruise past Rick’s Cafe and stop often along the way for pictures and leisurely moments. To contact us about our custom private Jamaica tours to Seven Mile Beach in Negril, Jamaica, or to check out our Negril Sunset Day Tour, call (876) 287-2180 or visit our website at: www.travelaroundjamaica.com. If you are looking for a warm and wonderful unique spring break getaway vacation location, then Jamaica is perfect, since it’s quite affordable, safe, and has endless unique and fun activities to do for everyone. Not too mention the fact that Jamaica is ranked #3 for best affordable Carribbean destinations by USNews.com. 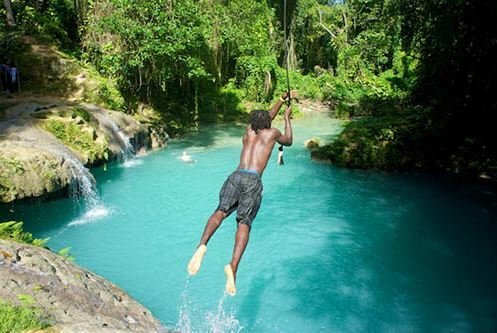 Here is a list of the most fun and affordable Jamaica tours for any spring breakers wanting to go somewhere that they will remember for the rest of their lives. The Negril Sunset Day Tour is one of the most popular tours we offer. And this tour is perfect for small or large groups or those making a day trip from Montego Bay. 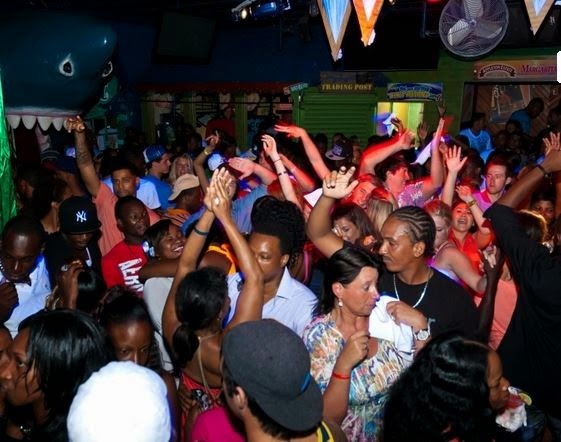 Negril, the “Capital of Casual” is a favorite destination for families, honeymooners and spring breakers. Negril’s picturesque coast, lined with towering cliffs and bustling beaches, is home to many world-class all-inclusive resorts, as well as nightlife hot spots. On this tour, experience the beauty and tranquility of uninterrupted white sand beach, savor the sun and throw off all inhibitions. First you will drive along a scenic coastline, enjoy sights such as the Tryall Water Wheel (if coming from Montego Bay), the ruins of an old British Military Base, shops selling coconut water and crafts and also local bars. We then spend a few hours at the Negril Beach – Jimmy Buffet’s Margaritaville! Here you can participate in an array of water sports activities or just swim, tan and stroll at your leisure. The crystal-clear turquoise water is well protected by numerous reefs and is free of rocks or undertow. We then make our way to Rick’s Café, driving through a small village called ‘Red Ground” giving you a close-up look at a Negril community, in real Jamaican style. 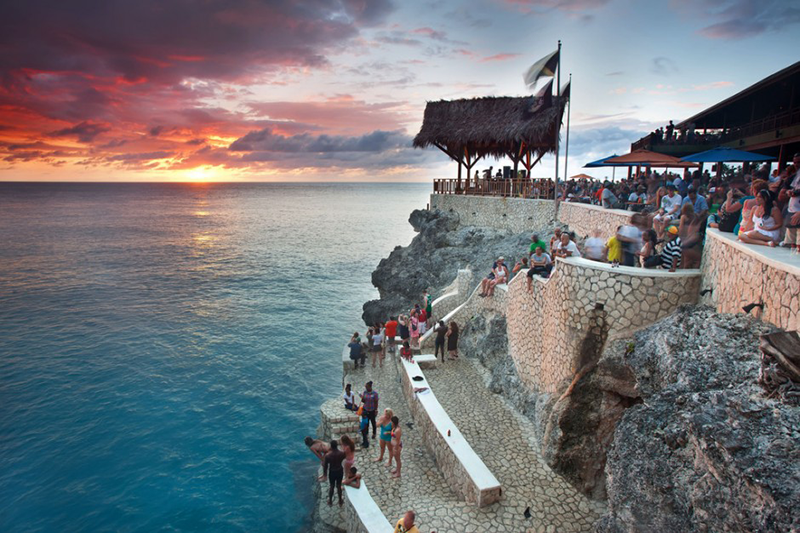 At Rick’s Café enjoy a live reggae band in a party atmosphere as you watch spectacular sunset and daring cliff diving. Lunch and beverages are available at an extra cost. For more info visit our Negril Sunset Day Tour page. 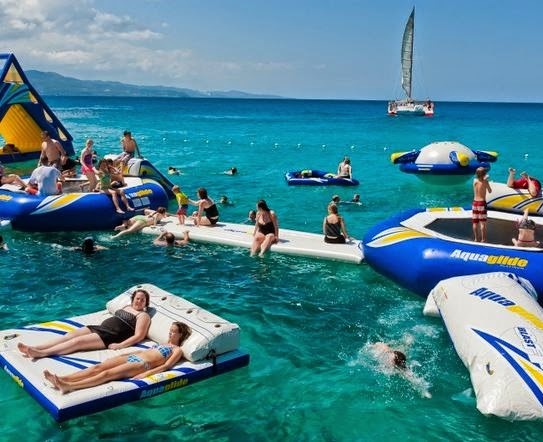 If you’re looking for a fun and affordable Jamaican travel tour package suitable for all members of your family, then the Montego Bay Highlight Day Tour is perfect for you. The Montego Bay Highlight Tour includes the following stops, but can be customized to suit your individual preferences. 2. Next tourists will be driven around the second city to various cultural local attractions, including the Richmond Hill Inn, which sits 500 feet above the bustling city. The Richmond Hill Inn was an 18th century plantation house that in the 1790’s was owned by the Dewars of Scotch Whisky fame. 3.The next stop on the Montego Bay Highlight Tour is a local Jamaican Jerk spot where you can purchase delicious Jamaican jerk chicken or pork with rice and peas, festival and and other authentic dishes and beverages made from local fruits and vegetables. 4.The fourth stop is a local craft market where you can find and purchase Jamaican craft items and souvenirs such as craft jewelry, mugs, t-shirts and wood carvings. As well as chit-chat with the local craftspeople. 5. 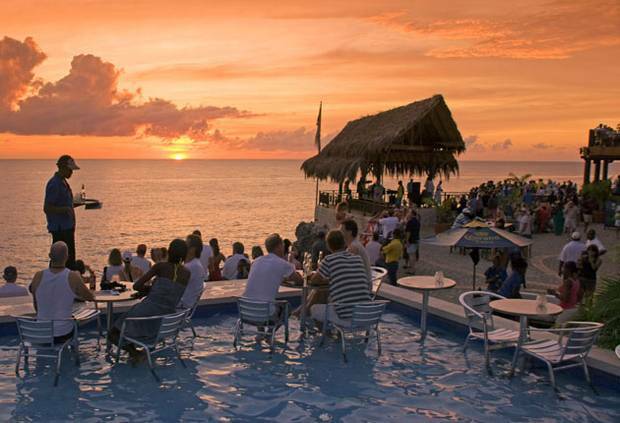 Our final stop on the tour is the world famous Margaritaville, located at Doctor’s Cave Beach, just north of downtown Montego Bay, at the end of the Hip Strip. Doctor’s Cave Beach is located in the protected Montego Bay Marine Park and consists of 300 yards of beautiful white sandy beach and transparent turquoise water. At Margaritaville you can relax and enjoy various activities and services (not included), such as swimming and other water activities (i.e. trampolines, slides, etc); as well as food, drinks, and music. And at night Margaritaville transforms into a night club with a great party atmosphere for those who like to go clubbing or out partying with friends. For more info visit our Montego Bay Highlight Day Tour page. Located in Ocho Rios, Jamaica, Dunn’s River Falls is a dramatic 600-feet drop of cascading water and one of the national treasures of Jamaica that attracts thousands of visitors every year. 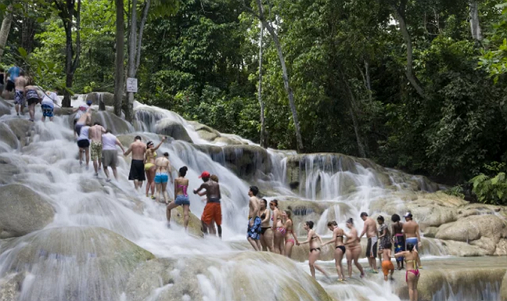 Dunn’s River Falls are truly breathtaking cascading waterfalls that offer 600 feet of climbing to its guests. If you are physically able to “climb” the falls it is a must –it’s an incredible cascading falls challenge. The visitors carefully climb up limestone cascades, hand-in-hand like a human daisy chain, guided by competent staff. The professional guides are very knowledgeable and will ensure your comfort and safety at all times. *Water shoes are required and are available for rent if you do not bring your own. For more info visit our Dunn’s River Falls Tour page. Black River is the capital of the Parish of St. Elizabeth on Jamaica’s South Coast and is located approximately 2 hours (by car) from Montego Bay. The Black River and Pelican Bar Tour is a great off-the-beaten path tour for people looking to discover the hidden natural wonders of Jamaica, such as the Black River, which is full of exotic species, such as the Alligator. The Black River is the largest navigable river in Jamaica, and includes the largest wetland area, i.e. the Black River lower morass. For more info visit our Black River Safari and Pelican Bar Tours page. The Blue Hole (Secret Falls) is a 20-foot cascading waterfall located in the lush rain forest just outside of Ocho Rios, Jamaica. During the Blue Hole Secret Falls Tour you can tube down the river; or jump, dive or swing on a rope off of the falls like Tarzan! And after visiting the Blue Hole you can arrange to go shopping in the town of Ocho Rios or visit the famous Margaritaville. For more info visit our Blue Hole Secret Falls Tour page. Besides the 5 Jamaica tours listed above what are your favorite tours that you have gone on in Jamaica ? Also make sure you visit our website at http://www.travelaroundjamaica.com for other great, fun and affordable Jamaica adventure and sightseeing tours. You can also call us at 1 (876) 287-2180 or email us at info@travelaroundjamaica.com. Although there are a wide variety of great Montego Bay, Jamaica, sightseeing and adventure tours, we decided to narrow down the list to our top 5 favorite Montego Bay sightseeing and adventure tours, so that travelers visiting Montego Bay can get a better idea of what sightseeing and adventure tours they should go on while visiting Montego Bay. The Blue Hole (Secret Falls) is a 20-foot cascading waterfall located in the lush rainforest just outside of Ocho Rios, Jamaica. During the Blue Hole Secret Falls Tour you can tube down the river; or jump, dive or swing on a rope off of the falls like Tarzan! And after visiting the Blue Hole you can arrange to go shopping in the town of Ocho Rios or visit the famous Margaritaville. Black River is the capital of the Parish of St. Elizabeth on Jamaica’s South Coast and is located approximately 2 hours (by car) from Montego Bay. The Black River and Pelican Bar Tours is a great off-the-beaten path tour for people looking to discover the hidden natural wonders of Jamaica, such as the Black River, which is full of exotic species, such as the Alligator. The Black River is the largest navigable river in Jamaica, and includes the largest wetland area, i.e. the Black River lower morass. If you’re looking for a fun and affordable Jamaican travel tour package suitable for all members of your family then the Montego Bay Highlight Day Tour is perfect for you. The Montego Bay Highlight Tour includes the following stops, but can be customized to suit your individual preferences. 2. Next tourists will be driven around the second city to various cultural local attractions, including the Richmond Hill Inn, which sits 500 feet above the bustling city. The Richmond Hill Inn was an 18th Century plantation house that in the 1790’s was owned by the Dewars’ of Scotch Whisky fame. 5. Our final stop on the tour is the world famous Margaritaville, located at Doctor’s Cave Beach just north of downtown Montego Bay, at the end of the Hip Strip. Doctor’s Cave Beach is located in the protected Montego Bay Marine Park and consists of 300 yards of beautiful white sandy beach and transparent turquoise water. At Margaritaville you can relax and enjoy various activities and services (not included), such as swimming and other water activities (i.e. trampolines, slides, etc); as well as food, drinks, and music. And at night Margaritaville transforms into a night club with a great party atmosphere for those who like to go clubbing or out partying with friends. Margaritaville in Montego Bay At Night. The Jamaica Zipline Adventure Tour is located approximately 30 minutes by car from Montego Bay, in the private Lethe Estates community along the Great River, and is home to the longest and safest zip lines in the Carribbean (ranging from 250 to 1600 feet long!). 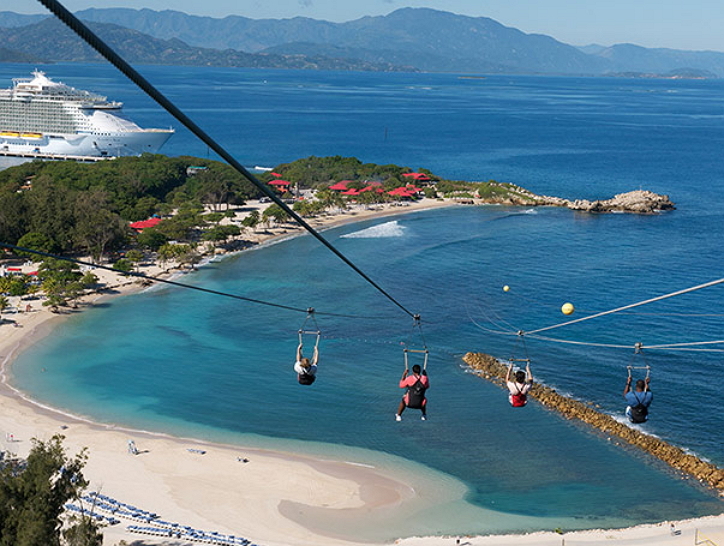 The 1600 foot Big Timba zip line is the longest in the Carribbean. For beginners there’s also a 250 foot zip line that is located much closer to the ground. The tour also includes a 250 foot Jungle Bridge and the zip line courses range from 35 minutes to 2.5 hours. 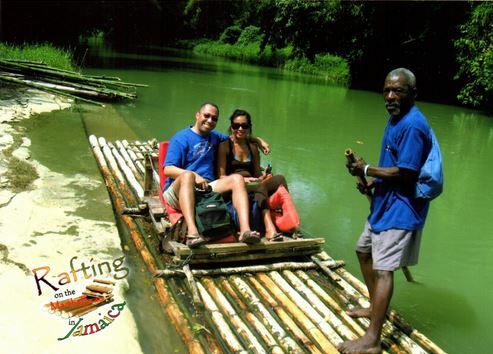 The Martha Brae River Rafting Tour is Jamaica’s #1 rafting attraction, located 20 miles from Montego Bay. The tour starts at the Rafter’s Village, which consists of over 5 acres of manicured lawn with picnic areas, souvenir shops, a swimming pool, a service bar and restrooms. The Martha Brae River Rafting Tour is a three mile, hour long ride along the Martha Brae River on a 30 foot bamboo raft, which is guided by one of 80 professionally trained and experienced raft captains. The river rafting tour ends at Martha’s Rest where there are more gift shops, a bar, restrooms, and a lounge area. You can also swim in the river during the tour, so make sure you bring your bathing suit if you want to swim! Hope you have enjoyed our list of our Top 5 Montego Bay sightseeing and adventure tours. Please let us know in the comments section below what some of your favorite Montego Bay sightseeing and adventure tours are? 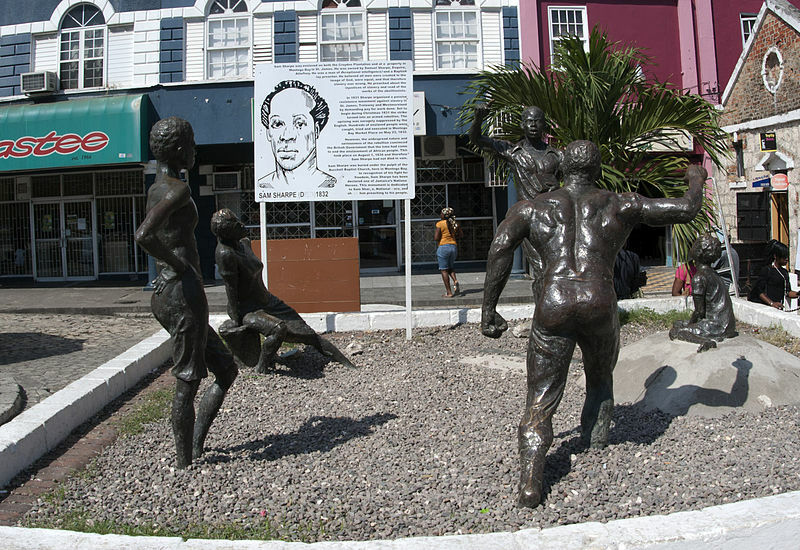 Find out more about the other Montego Bay Tours we offer, visit our website at: http://www.travelaroundjamaica.com. Receive our latest blog posts via email! Sign up to follow our Travel Around Jamaica blog to receive our latest Jamaica tour info, blog articles and deals!